we have put 6 months behind us already- can you believe it?? here's to many, many more! 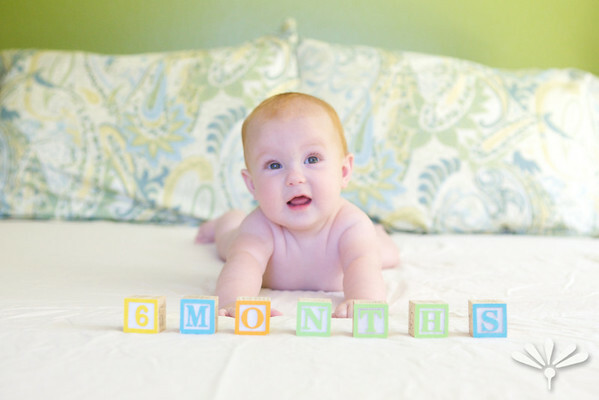 I promise to try and refrain from saying this every month from now on (aside from maybe when Jay turns a year old) but seriously where does the time go?!?!?! 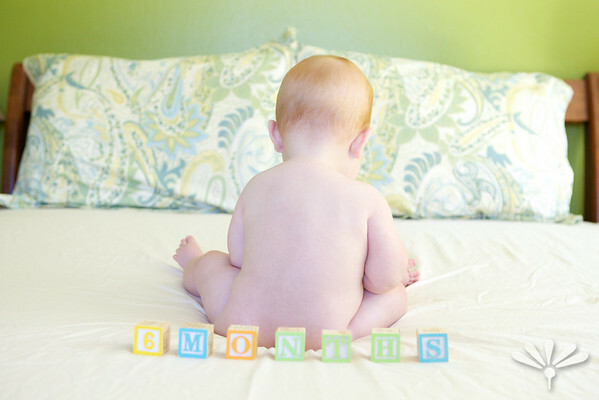 6 months- my baby is 6 months old, how can that be? Honestly, the time flies by so quickly but I LOVE this age so much!! Jay is on the verge of being mobile but isn’t quite yet, he is really developing his personality, is curious about everything right now and is just so much fun to be around; I am constantly thanking God and my wonderful husband that I am lucky enough to be home every day to watch Jay discover the world around him. Seriously, it doesn’t get any better than this! *Jay is constantly rolling right now. Regardless of where this child is placed he definitely does not end up in the same place! He flips to his belly (which he has been doing for quite a while now) frequently to hang out and play. He can also flip the other way, belly to back, which is more of a new development. *Everything in any one’s hand or within reach of our little Jay Bird is fair game as far as he is concerned. I continue to drink out of cups with lids and have gotten very strategic about doing anything while holding him. *Jay is endlessly curious; right now the world around him couldn’t be more fascinating! He must have/touch/hold/eat everything that he sees right now(see the comment above), he is constantly looking around and taking everything in. It is so much fun to watch him discover the world and all of the new things around him. 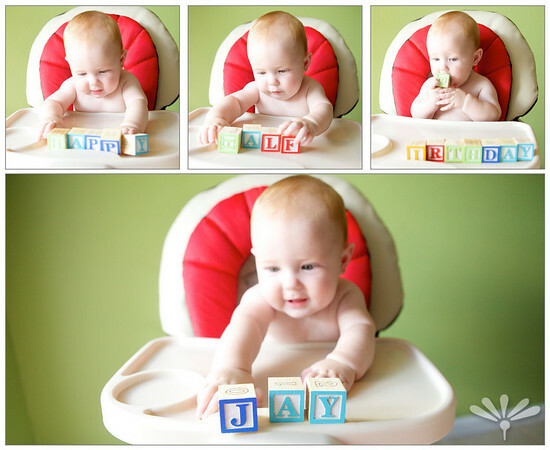 *He has been sitting unassisted for a while now. It started as more of a tri-pod type motion; however, he can now sit by himself for a short period of time- mainly while he is playing with his toys. 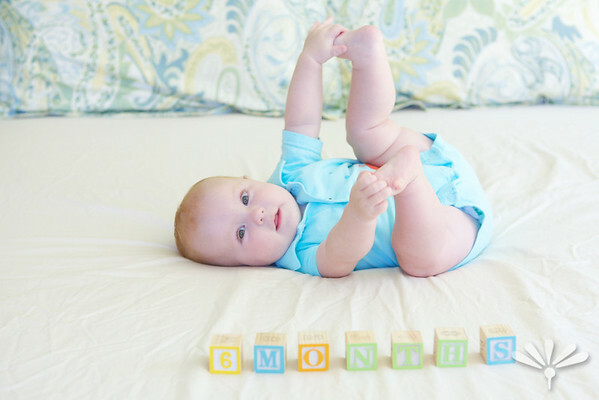 He can even sit up most of the way on his own; he can sit up from a semi-reclined position but he hasn’t gotten down how to stabilize himself enough to stay there when he gets up. *Sleeping, things are much better on this front right now. He has slept through the night a few times and even a few nights in a row, he is also napping pretty well a few times a day. Nothing is consistent nor regular; however, the important thing here is that he can sleep through the night and therefore there is light at the end of a long tunnel. *Our little guy is ticklish! Under the armpits and under the neck especially but he does have a few other “spots” as well. It you get him at just the right spot he will reward you with a full out belly laugh. *We are loving our stroller rides right now. Regardless of the heat, Jay loves to be outside cruising the neighborhood. *Books- Jay has continued to love being read to. Jamie and I started very, very early with him on this and he still loves it. He will look at the pictures and follow along while you read; it adorable! Currently his favorite is Hand, Hand, Fingers Thumb; thanks to Mary Beth and Sean for the wonderful gift. He knows the cover by sight and gets the biggest smile whenever he sees it and we start to read. *Watching his puppy and kitties- Jay constantly watches the animals in the house. He looks for them in places where he knows they will be and watches them intently whenever they are around. *His Jumper- seriously our kid can jump! It’s like a switch is flipped when he is put into the jumper; he immediately starts jumping and go’s and go’s until he is taken out. He has gone for 45minutes at a time before, I am not kidding when I say he loves it. He especially loves if you play hide and seek with him while he is in the jumper- that trick is sure to turn on his giggle box! *Singing songs with hand motions. His favorite of my complete repertoire is anything that also has a hand motion along with the song; The Itsy Bitsy Spider, If You’re Happy and You Know It… actually I usually make up motions to any songs that I sing since he likes it so much- I am sure it’s comical to all that watch. *Sunglasses- I had to think long and hard to fill in this category since he is a pretty happy boy as long as his belly is full and he is well rested. However, he doesn’t really like when people wear sunglasses. It’s almost like he can’t figure out who you are when you are wearing them, he just kind of stares at you funny until you get the hint and move them.